Addgene is a global, nonprofit organization dedicated to making it easier for scientists to share plasmids. As a repository, institutions provide (or deposit) materials with us for distribution. Then, institutions order (or request) materials from us. Addgene distributes all materials under the terms of the UBMTA. As part of each deposit we require a Deposit and Distribution Agreement, and for each request we require a Material Transfer Agreement (MTA). We have developed streamlined, user-friendly, and efficient systems for both depositing and requesting. We provide peace of mind that each transfer is accompanied by the proper legal paperwork for each transfer and provide detailed reporting to ensure that your institution is aware of both outgoing and incoming materials. After a scientist initiates a plasmid deposit to Addgene, Addgene will generate a Deposit and Distribution Agreement detailing the materials in the deposit. Visit our Deposit page for more information about depositing plasmids. The Deposit and Distribution Agreement is sent to the authorized person/office who approves deposit agreements, or to the depositing Principal Investigator (PI) to obtain approval from the authorized person/office. 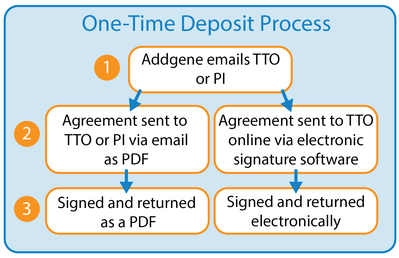 Depending on your institution's deposit agreement processing requirements, Addgene's Deposit and Distribution Agreements can either be approved through a signature on paper, electronic signature, or electronic approval through your Addgene Technology Transfer Account. To read more about how to approve materials through your account, please find more information regarding our Master Deposit Agreements below. 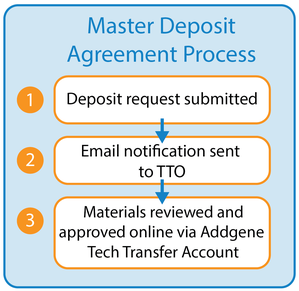 Addgene deposits can be approved in one of two ways: a One-Time Deposit and Distribution Agreement or a Master Deposit Agreement. A One-Time Agreement can be signed by an authorized person either through a PDF/paper signature or through electronic signature. After the deposit is initiated by the researcher, the One-Time Deposit Agreement is generated (1). This agreement is sent to either the PI or the Providing Institution’s Technology Transfer Office (or Office of Sponsored Programs, Legal Office, etc.) (2). PDF Option - If the agreement is sent to the PI, Addgene will send this agreement via email as a PDF. This agreement can then be signed by an authorized person and returned via email/PDF. Electronic Option - If the agreement is sent to the Providing Institution’s Technology Transfer Office (TTO), the agreement will be sent either via email as a PDF, or it will be sent for electronic signature online. These two options will differ depending on the TTO’s preference. With a Master Deposit agreement your institution can sign the terms upfront once for all future deposits (1). Then, the materials themselves can be reviewed and approved through an Addgene Technology Transfer Account that Addgene will create for the authorized office (2). This office can be a Technology Transfer Office, Office of Sponsored Programs, Office of Technology Development, Legal Office or similar. After the Master Deposit Agreement is signed, the authorized office will receive email notifications each time there is a new deposit (3). We must have a centralized office where all deposit notifications can be sent for this Master Deposit Agreement option. Over 100 institutions have currently signed this agreement and are using this process. If your institution requires additional information (through an institutional form or similar) from the PI or lab before outgoing materials can be approved, we have the ability to host a Questionnaire for your institution which would incorporate your internal questions into our deposit processes. To view sample one-time and master deposit agreements, please see our sample agreements. After a scientist initiates a plasmid request from Addgene, we will generate a Recipient Scientist Acknowledgement that will ask the scientist to confirm that they understand the terms of the UBMTA. 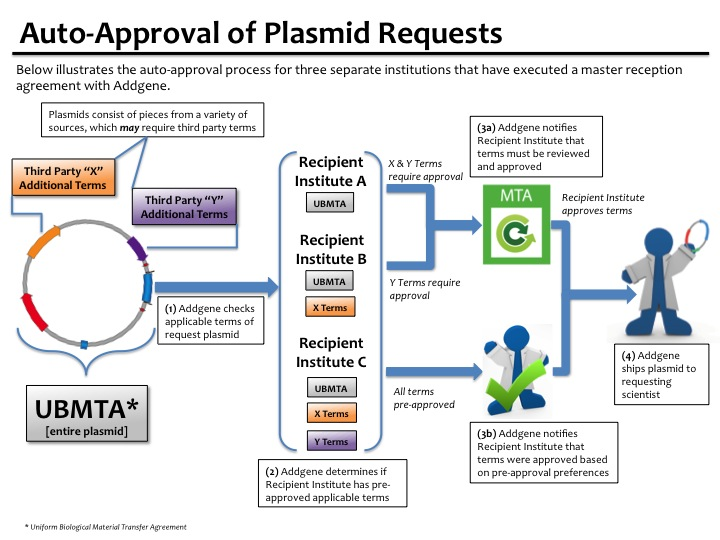 More information about requesting plasmids from Addgene can be found on our ordering page. We can also include institutional forms during this ordering process so that scientists can submit additional information to your office at the same time they acknowledge the UBMTA. We can do so by linking to your institution’s website, or by hosting a questionnaire through our website. 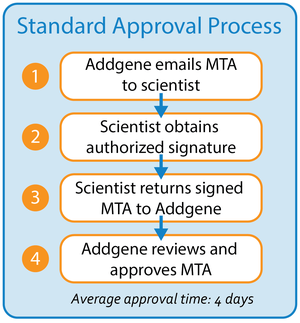 Once the scientist completes those steps, Addgene will generate their request’s Material Transfer Agreement (MTA) and send it out for approval. There are multiple options for approving an MTA, some of which are more efficient for scientists and technology transfer officers alike. These options are the Paper Method, Electronic Approval Method (eMTA), and the Auto Approval Method. This is the default option through which the MTA is sent to the requesting scientist (1), who must then print the MTA and forward it to the appropriate signatory’s office for approval. Scientist must identify the authorized signatory and go to them for signature (2). Read more about who is authorized to sign MTAs. Paper MTAs could be signed by unauthorized parties (i.e., scientists) if they are unaware of their institution's policies for these agreements. The signed MTA can be submitted to Addgene (3) by uploading it to the Order Checklist page, via email as a PDF file, or by fax. 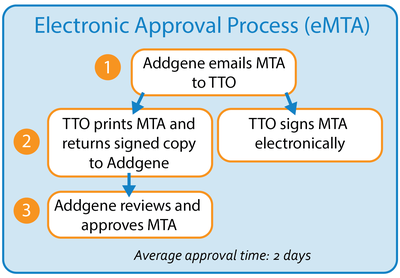 Addgene then reviews and processes the MTA once we receive it (4), which will then allow us to prepare the requested materials for shipment. Rather than the scientist handling each MTA, this option allows all agreements for an institution to be sent directly to the office authorized to approve them. Addgene keeps email addresses on file for the authorized office, which we use to notify the office about each pending MTA (1). The scientist is also provided with those email addresses in case they have any questions about their institution's approval process. Otherwise, they do not need to be involved in the MTA process, allowing them to continue focusing on their research. The authorized office can then approve each MTA electronically through our website (2), a feature that is not available through the Paper Method described above. As soon as the electronic signature for every implementing letter in the MTA is submitted, the requested materials will begin preparing for shipment. Addgene does not need to review the signed agreement because we know it went directly to the authorized office (3). 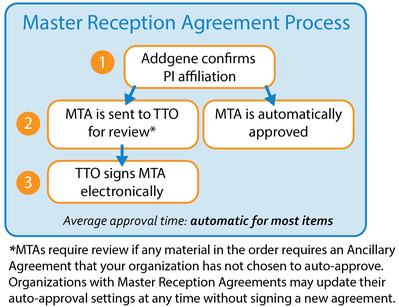 The final option is only possible once your institution signs a master reception agreement with Addgene. Once a master agreement is negotiated and signed by the authorized office, they can then choose to have MTAs auto-approved rather than submitting electronic signatures each time. With this option, after a scientist acknowledges the MTA through our website (as well as any institution forms when applicable), Addgene will then verify that the scientist’s PI is truly affiliated with the requesting institution (1). As soon as this verification is completed, the MTA will either be automatically approved (2), or sent to the authorized office for review depending on the settings they choose for their institution (2,3). If we cannot verify the PI’s affiliation we will contact them and/or the requesting scientist directly. Auto-approval allows the requested materials to begin preparing for shipment as soon as our PI affiliation verification is completed, rather than waiting for the MTA to be reviewed. To view a sample implementing letter and master reception agreement, please see our sample agreements in our Resources section. An Addgene Technology Transfer Account, or Tech Transfer Account, provides your institution the ability to approve and track incoming and outgoing materials. You can sign up for a Tech Transfer Account by emailing [email protected]. Addgene's intuitive online Tech Transfer Account pages allow you to view an inventory of deposited and requested items anytime, and give you access to digital copies of executed MTAs. Addgene's Tech Transfer Account sends you an email summary of material transfers through Addgene on a daily, weekly, or monthly basis. Set your preferences through your Tech Transfer Account page or email [email protected] for help. If your institution is on a Master Agreement for either Requests or Deposits, you can approve materials, in or out of your institution, directly through your Tech Transfer Account, thereby saving your office time and streamlining the Material Transfer process. Does your institution’s Technology Transfer Office require researchers to complete an internal form or questionnaire before processing deposit agreements or MTAs? Many of Addgene’s plasmids contain technologies that are owned and/or licensed by third parties. For more information, please visit our Terms Accounting for Third Party Rights page. To read our newsletters, please visit our Technology Transfer Newsletters page. Do researchers at your institution receive many plasmid requests for their materials from their colleagues? If so, encourage them to deposit their materials with Addgene! Depositing is easy and free. Labs save time and money associated with shipping samples. Plus, earn free Addgene plasmids. All plasmids and data are securely archived for the future. Improved visibility for research as the scientist joins a global repository with over 3,500 depositing labs. Modify this template to suit your institution's needs. Log into your Tech Transfer Account to find and add information and stats specific to your insitution. Addgene is a nonprofit plasmid repository that facilitates research by authenticating, archiving, and distributing plasmids and their associated data. Addgene has worked with over 3,500 laboratories from around the world to assemble a collection of over 65,000 plasmids. The plasmid collection represents a broad range of disciplines and can be used for a variety of functions such as genome engineering, gene knockdown, viral gene delivery, as well as many applications for use in a wide range of cells and organisms. Addgene is continuing to expand its collection and invites you to join the community. Do you receive requests for plasmids you've made in your lab? You can deposit them to Addgene at no cost. You will have more time for your research, Addgene will handle the samples and MTA compliance, and you will have a full record of where your plasmids have been shipped. To learn more, visit www.addgene.org. If one of your researchers is interested in depositing, have them visit our Deposit Page.